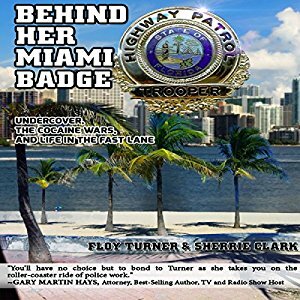 Lee Ann was honored to be the voice of Floy Turner in Floy’s biography/memoir Behind Her Miami Badge: Undercover, the Cocaine Wars, and Life in the Fast Lane. Floy wrote this book with author Sherrie Clark. Floy is a courageous, honorable, and very funny lady. To listen to a sample and/or purchase from Audible, head here. Posted by lahowlett on October 12, 2016 in Uncategorized and tagged Audible, audiobooks, Behind Her Miami Badge, biography, crime, Florida Highway Patrol, Floy Turner, memoir, Miami drug wars, Sherrie Clark.